MessyJesse - a quilt blog by Jessie Fincham: Folksy Friday! Here is my first! 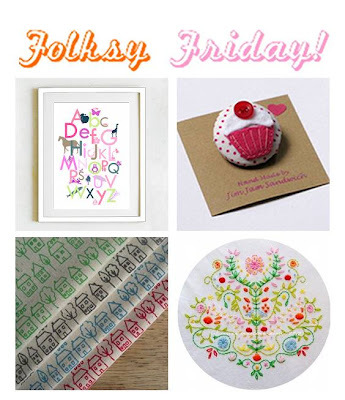 Folksy Friday, I hope you enjoy some of the things I have found for you :) I will be showcasing some lovely things, so be sure to check back each week for more British handmade loveliness! From top left: 1. Children's Alphabet, by Hello Monkey, 2. Cupcake Brooch, by Jim Jam Sandwhich, 3. Avenue - Pack of 4 Fabric's, by Lusummers, 4. Embroidery Pattern - Tree of Life, by Polka & Bloom. Phew I thought you were going to ask us to pick a favourite , too hard too many nice things . That embroidery is incredible! I've never really gotten into it; it's a little too labor intensive and slow-going. But I'd sure like to get my hands on those fabrics! Nice presentation and good photographs in your blog. Easy to read. Blog looks great. Thank you so much for the words of encouragment Jesse! And its nice to meet you! Your site and your stuff is so uber cute! I look forward to following your site!